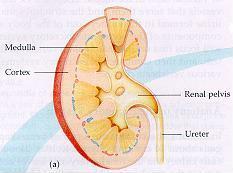 The kidney is a vertebrate adaptation to regulate the composition of blood. It permits water, vitamins, minerals, and some other solutes to remain a part of the blood composition while removing wastes, such as urea, in a concentrated form called urine. In humans, it is a bean-shaped organ in the superior pelvis, suspended by fatty tissue. It consists of the outer cortex, the inner medulla, and the renal pelvis. 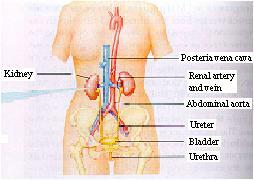 Blood enters the kidneys through the renal artery and exits through the renal vein. At any given time, the kidneys contain about twenty percent of the body's blood. The urine collected in the renal pelvis drains through the ureter into the urinary bladder, where it is stored until it is excreted through the urethra. 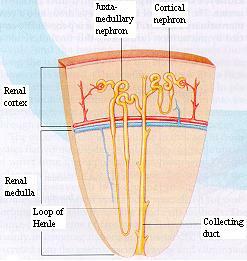 Each kidney in a human contains about a million nephrons. These nephrons make the actual changes to the blood composition.